"Thousands of years ago, colonies were established throughout the universe by a mother race from the far reaches of the universe...a race known as -- human. Now, in the seventh millennium of time, a solemn and dramatic event is taking place...A peace envoy representing the twelve known colonies of man moves through space in hopes of bringing to a close a thousand-year-war..."
This is the "Marvel Super Special!" in "Full Marvelcolor! ", a "Special Collector's Edition!" (Boy, someone at Marvel sure liked exclamation points back in the day...) In more specific terms, for $1.50, fans of Battlestar Galactica could read and enjoy this over-sized "official adaptation of the television sensation!" Based on the three-hour "Saga of a Star World" by Glen A. Larson - the series premiere - this adaptation is written by Roger McKenzie and drawn by Ernie Colon. As with many comics of the age, this four-color version of a popular TV show is fascinating primarily in the way it differs from the broadcast material. Specifically, some of the ship and character designs are very different from the now-familiar versions fans remember. For instance, Baltar does not resemble John Colicos whatsoever in the comic, but is instead a bald, hulking figure, almost alien in appearance (like Klaus Kinski as Nosferatu). Sire Uri (portrayed by the late Ray Milland in the TV version) is here depicted in a strange way too: as an overweight, hoggish figure. Yes, he actually resembles a pig. Story-wise, the comic also reflects Baltar's original fate, before it was altered to make the traitor a regular character on the series. As fans will recall, in the movie version (which played in theaters internationally), this original (and grim) fate was restored: A Cylon Centurion slit Baltar's throat at the behest of the Imperious Leader. 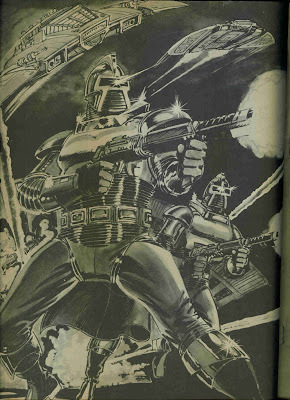 In accordance with that original material (not the TV show), the comic features a Cylon murdering the man and depicts Baltar's bloodied (slit...) throat and a sword dripping blood. Interestingly, the scene is set "in a shadowed chamber somewhere on a hellhole known as Cylon." Even in the filmed version of the material, it occurs on a Cylon base ship, not a planet. Perhaps most significantly, Caprican reporter Serina (Jane Seymour in the film) is in the comic book referred to as Lyra, and she is suffering from a fatal space malady that will soon take her life (a plot point adopted for the Laura Roslin character in the re-imagination). The last page of this comic edition sees Lyra begging Captain Apollo "Please, Apollo, no questions! Just whatever happens...promise me you'll look after Boxey." I remember taking this comic-book with me on a six-week cross-country road trip in 1979, when I was nine years old. I must have read it a million times (that, and a comic-book version of the original King Kong film that I found in a Ben Franklin store in Wisconsin). In addition to the comic-book adaptation, the Battlestar Galactica super spectacular features portraits of Starbuck, Ovions, Commander Adama and Muffit, as well as a variety of articles by Tom Rogers. These included "Life in the Future," "Battle Tactics," "Spaceships and Such: Hardware Of the Future," and "Aliens and Robots." The comic also features a piece called "The Wizard of Hollywood's Dream Factory," an interview with special effects artist John Dykstra by Steve Swires.